A granite pegmatite 6 kilometers northwest of the village of Linópolis, east of Governador Valadares. Various names have been applied to this locality. Aimorés pegmatite district, Eastern Brazilian pegmatite province. Mine Information: Originally developed as an open pit mine a year after discovering a gemmy mineral in 1942, and later determined to be brazilianite in 1945. The cleavability and softness were thought to be the result of weathering, so 2 short exploratory adits were driven. In late 1944, E.R. Swoboda, an American mineral dealer, aware of the rarity of the crystals, obtained a lease on the locality and supervised additional excavation of the pegmatite, providing the USGS with a number of fine specimens for their use. Geology: Eastern Minas Gerais is for the most part underlain by Precambrian dark-colored schists and gneisses, light-colored granitoid gneisses, and sericitic quartzites. 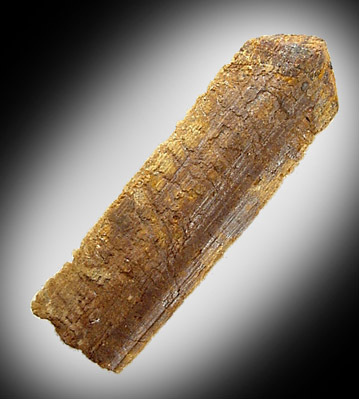 Locally, the pegmatite strikes approximately east-west, dips steeply to the north, and is a tabular mass essentially in alignment with the schistosity of the hosting biotite-garnet schist. Its thickness ranges from 3 meters at the surface to 1.5 meters in the lower cross-cut adit. Texturally and compositionally, the pegmatite can be subdivided into three units working in: a massive border zone (massive albite with minor quartz and muscovite), a crystal cavity zone, and a quartz lens. The border zone contains thin, elongate, blue-green masses of scorzalite and souzalite, up to 25 cm long, extending across the zone normal to the contact. 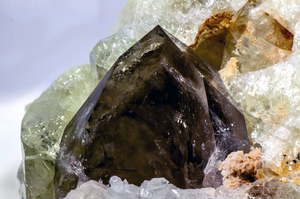 The cavity zone is characterized by irregular vugs and crystal cavities bordered by stubby, terminated quartz crystals, well-formed brazilianite crystals, and rhomboid masses of limonite-stained muscovite. Cleavelandite and porous and massive albite all occur in this zone, and in general, a higher proportion of quartz and muscovite occur here. The quartz zone was mined out by 1947. Albite, muscovite, and quartz make up more than 99 percent of the pegmatite. 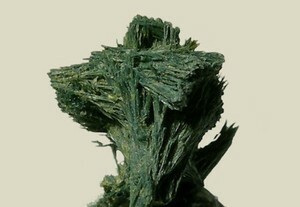 Six phosphate minerals are present including scorzalite and souzalite, brazilianite, blue-green apatite, and two unidentified [as of 1947] phosphates. Tapiolite and zircon are rare accessory minerals. 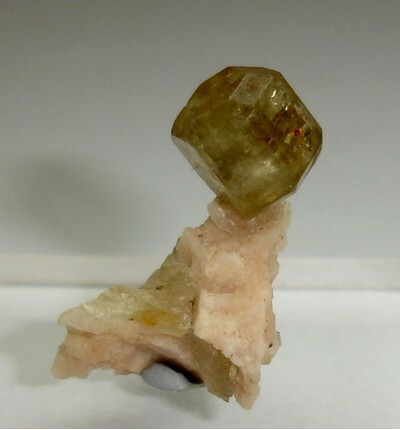 Beryl and tourmaline, found in the stream bed below the pegmatite, were not observed in the exposed parts of the pegmatite. As is true for many of the regional pegmatites, a well-defined contact with schist and the texture of the border facies support the hypothesis of intrusion of a magmatic fluid which consolidated from border to center after emplacement. However, while accessory phosphate minerals are common in many pegmatites near the Córrego Frio locality, they are rare in pegmatites of other districts in Minas Gerais. Massive albite is characteristic of the early stage of pegmatite consolidation, whereas cleavelandite has formed in the late stage. Scorzalite, souzalite, and apatite are intermixed with massive albite in the border zone and are included by crystals of brazilianite and quartz in the crystal cavity zone. Shell-Iike intergrowths of apatite and massive albite in the outer margin of the crystal cavity zone indicate that apatite began to form near the end of massive albite formation. The field relations support the hypothesis of continuous crystallization from a magmatic to an autohydrothermal stage. 20 valid minerals. 3 (TL) - type locality of valid minerals. 1 erroneous literature entry. Reference: Cassedanne, J.P. (1983): Famous mineral localities: The Córrego Frio mine and vicinity, Minas Gerais, Brazil. Mineralogical Record, 14 (4): 227-237; Palache, C., Berman, H., & Frondel, C. (1951), The System of Mineralogy of James Dwight Dana and Edward Salisbury Dana, Yale University 1837-1892, Volume II: 911; Mineralogical Record: 14: 233; Rocks & Minerals (1988): 63: 42. Description: Leavens, P. et al, Compositional and Refractive Index Variations of the Herderite-Hydroxyl-herderite Series, Am Min v63, p 913-917 (1978) reported that in all the world, they could find only one true herderite specimen and that was a faceted gemstone. 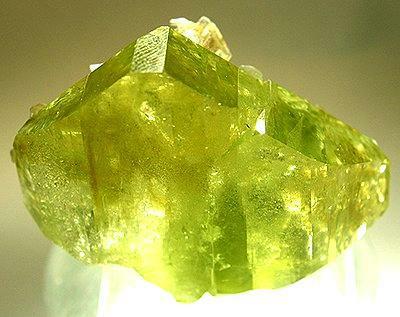 Reference: American Mineralogist (1948): 33: 205; Mineralogical Record: 14: 233. Reference: American Mineralogist (1949): 34: 83; Palache, C., Berman, H., & Frondel, C. (1951), The System of Mineralogy of James Dwight Dana and Edward Salisbury Dana, Yale University 1837-1892, Volume II: 911. Pecora, William T. and Fahey, Joseph J. 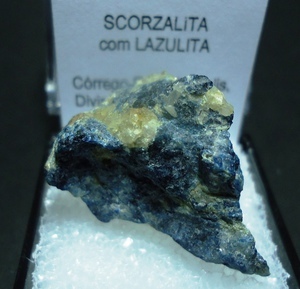 (1947) The Corrego Frio Pegmatite, Minas Gerais: Scorzalite and Souzalite, Two New Phosphate Minerals, USGS [see link below]. American Mineralogist (1948) 33: 205. Palache, C., Berman, H., and Frondel, C. (1951) The System of Mineralogy of James Dwight Dana and Edward Salisbury Dana, Yale University 1837-1892, Volume II: 911. 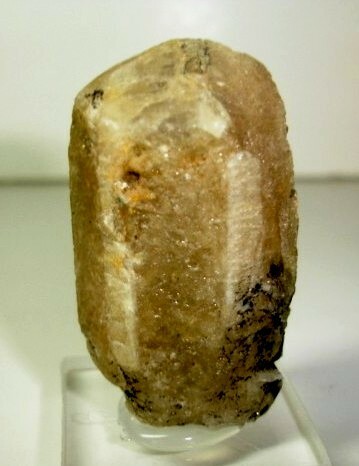 Cassedanne, J.P. (1983) Famous mineral localities: The Corrego Frio mine and vicinity, Minas Gerais, Brazil. 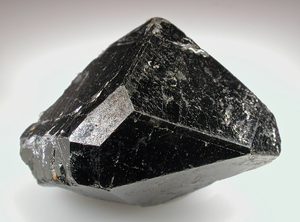 Mineralogical Record, 14 (4): 227-237. Rocks & Minerals (1988) 63: 42.